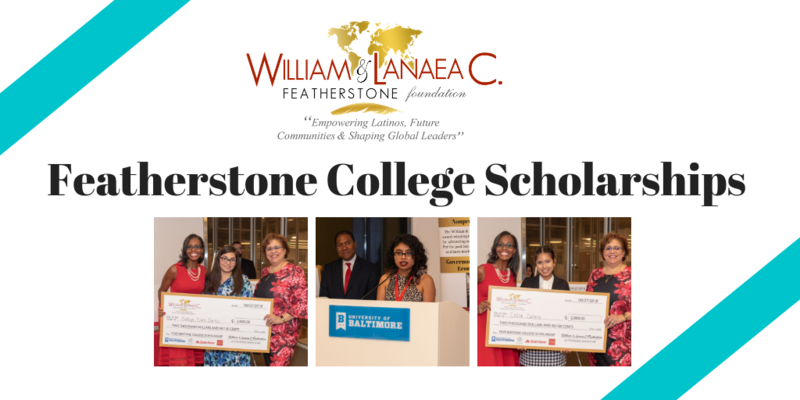 In 2016, the William & Lanaea C. Featherstone Foundation created the Featherstone College Scholarships to promote higher education and to empower the next generation of student leaders. To date, we have awarded a total of $32,000 to 13 students. In Fall 2019, selected students will receive $2,000 merit-based awards to attend the University of Baltimore. Scholarships are open to high school seniors who will start their first semester at the University of Baltimore, undergraduate students applying to transfer to UB, as well as current U.B. college freshman, sophomores, juniors, seniors and graduate students. Application Deadline: March 4, 2019 at midnight. Award Ceremony: Honorees will be recognized during a special ceremony. Have you applied to the University of Baltimore for 2019 fall admission? Household Income (your parents' combined income). Are you (or will you be) the first person in your immediate family to go to college? How did you find out about the Featherstone Foundation's scholarship program? *Note, if you are selected to received a scholarship award, we may ask for back-up documentation to verify your annual household income, ethnicity, or ask questions regarding supplemental information provided. Completing an application does not guarantee a scholarship award. A selection committee will review all application materials and determine the winners.